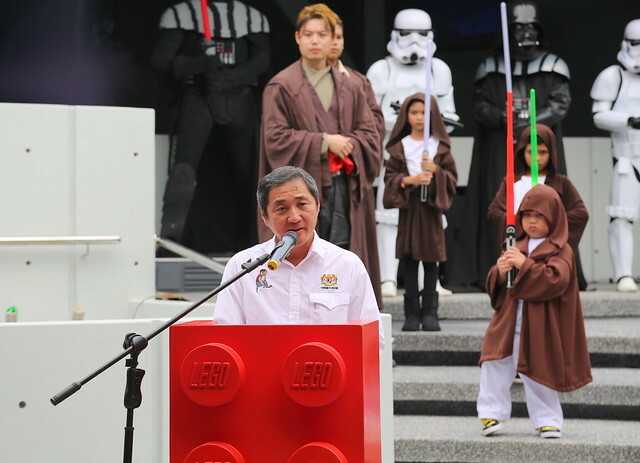 LEGOLAND Malaysia today opened a brand new section - the Star Wars Miniland! 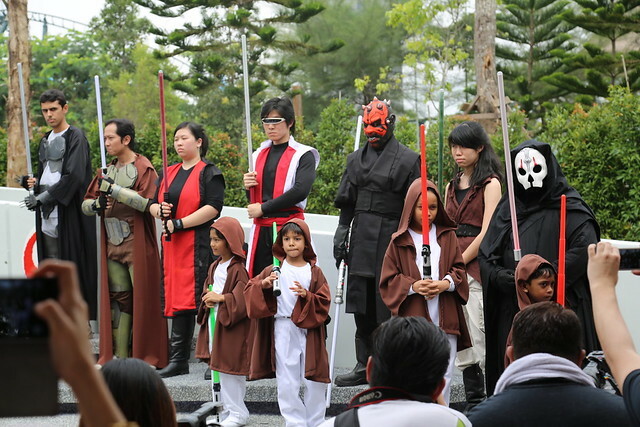 Featuring seven beloved scenes from the Star Wars franchise, this RM6 million attraction is the first of its kind in Asia. 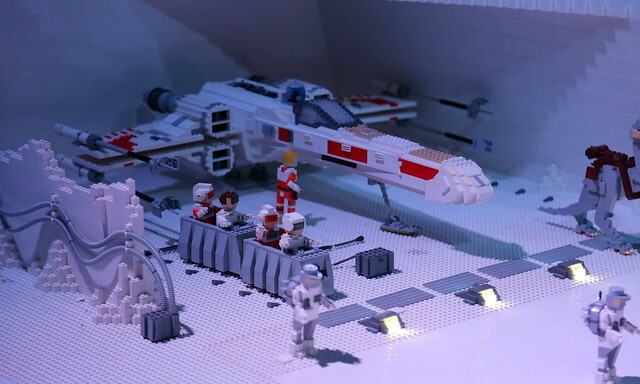 It's got over 2,000 LEGO models for you to gawk at, from tiny Yoda to the largest LEGO model of the Millennium Falcon ever built. OK, it's official, I want to be a LEGO builder. I love spending insane hours fiddling with the tiny pieces. 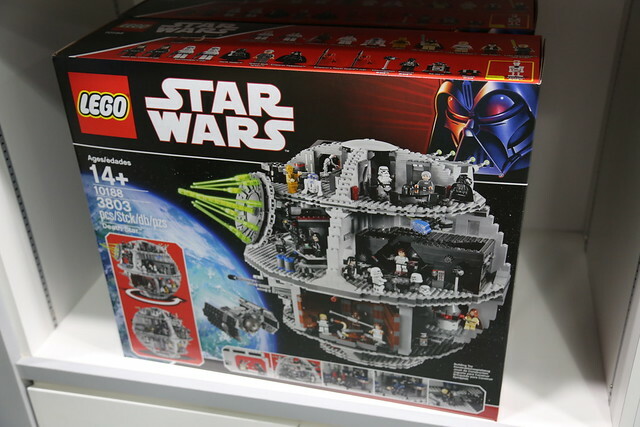 And to build Star Wars stuff? I'll never sleep! 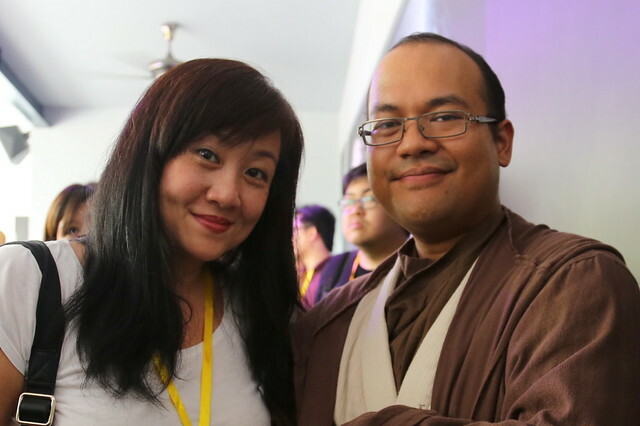 Here I am with "Master Jedi" Azfaren Aznam, Entertainment Coordinator at LEGOLAND Malaysia. Gosh, they have such fun jobs! 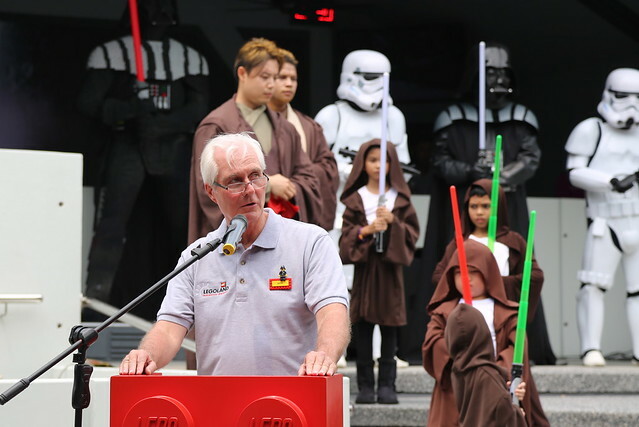 Mark Germyn, General Manager of LEGOLAND Malaysia, says the Star Wars Miniland took 1.5 years from concept to reality. The models were built in six months, with half done in Malaysia, and the rest shipped from Germany and the Czech Republic. 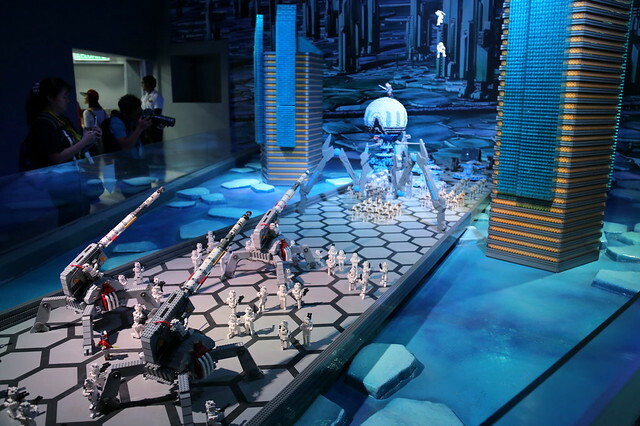 The Master Builders team took about 8,000 hours to complete the 1:20 scale models using 1.5million LEGO bricks. This is in conjunction with their upcoming second anniversary. Dato' Dr Ong Hong Peng, Secretary General of Tourism, was guest of honour but the adorable little boy behind him stole the show, wiggling about. Must be chafing in the heat. 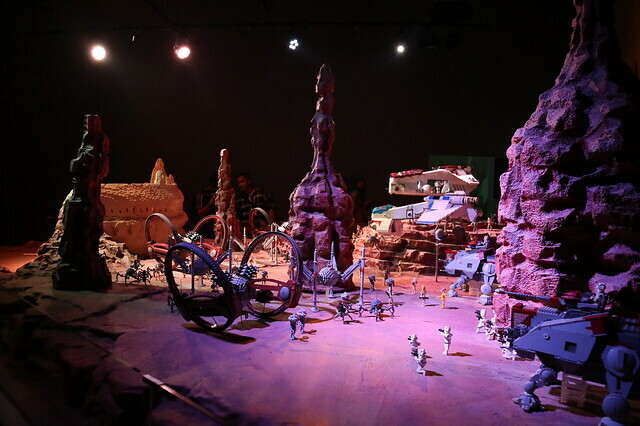 Which is why it is a major relief that the Star Wars Miniland is indoors and fully AIR-CONDITIONED!!! That also makes certain lighting and sound effects possible. 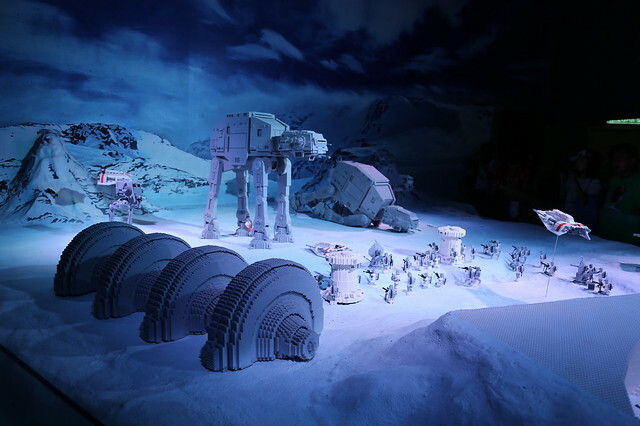 The LEGO Star Wars Miniland is housed in an octagonal building, with a floor size of 900sqm divided into eight areas - seven iconic scenes and a retail area that includes hard-to-find LEGO sets. 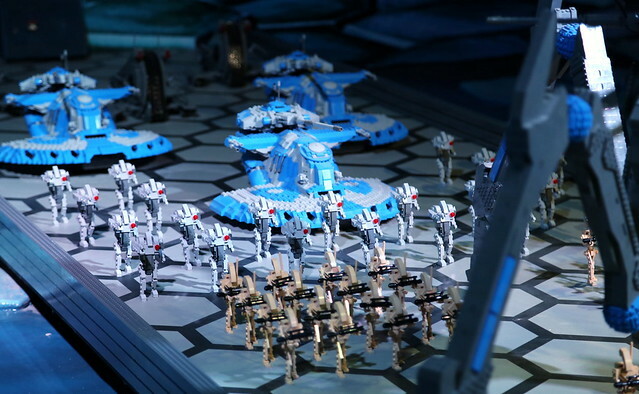 The Battle of Naboo pits Gungans against Trade Federation battle droids. This is from Episode I: The Phantom Menace. 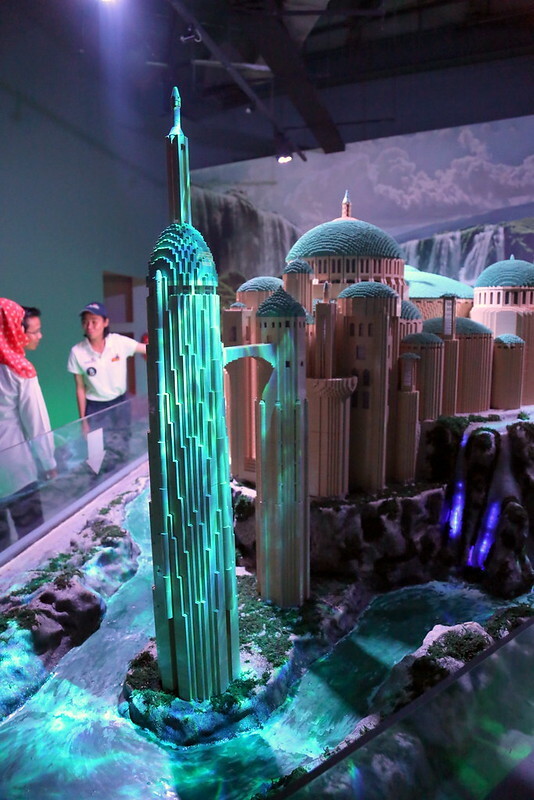 The royal palace of Naboo weighs 63kg and is made of 25,000 LEGO pieces. 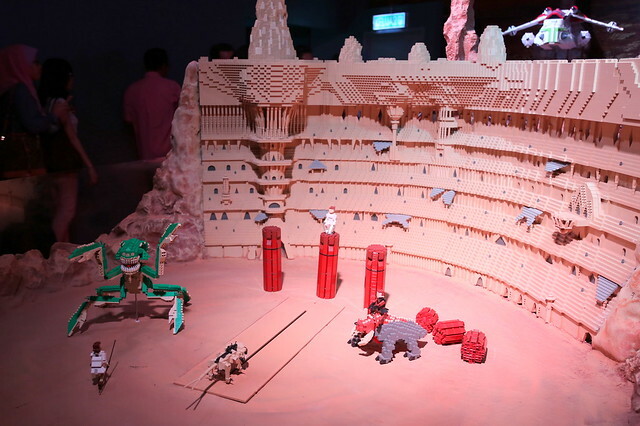 There's also a hangar in which Obi-Wan Kenobi and Qui-Gon Jinn battle it out with Darth Maul. From Episode II: Attack of the Clones, we have the grand clash between Count Dooku's droid army and the Grand Army of the Republic. Geonosis is the most populated scene with 247 models. The Geonosis execution arena: Watch Padme Amidala, Obi-Wan Kenobi and Anakin Skywalker battle ferocious creatures - the massive reek, the acklay and the nexu. 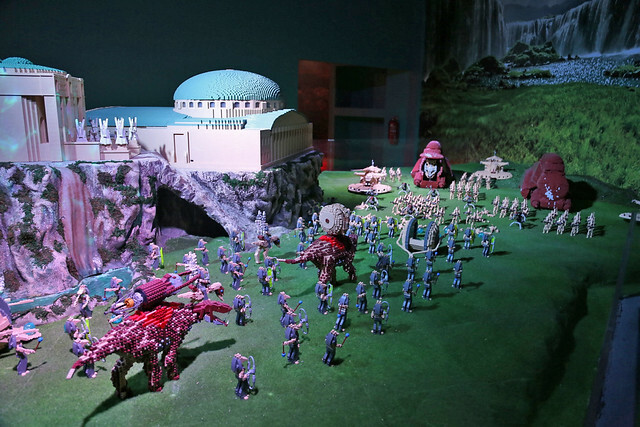 This arena was built to 1:80 scale because it would be 29 feet high if it had been built at 1:20 scale like the other Miniland models. 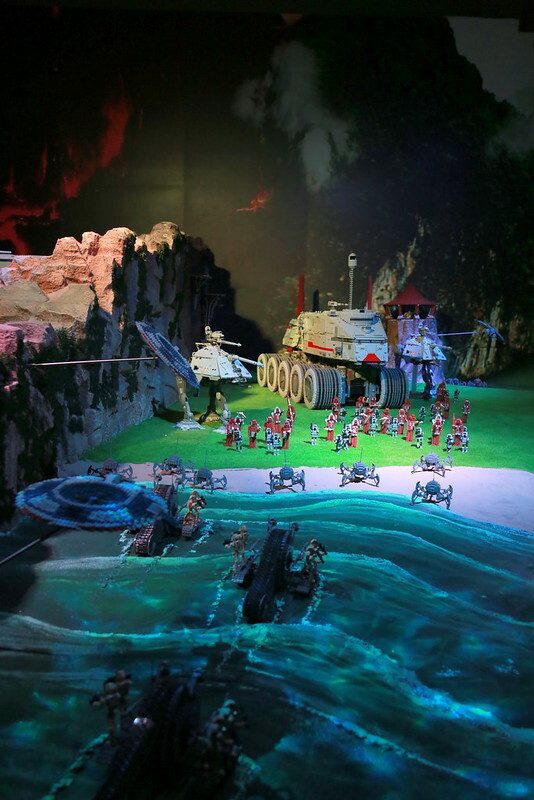 The Droid Army's amphibious assault on Chewbacca's home planet Kashyyyk. The Wookiees stand ready to face battle droids and dwarf spiders. The massive clone turbo tank you see This is from Episode III: Revenge of the Sith. Look at the rust detail on the LEGO bricks! 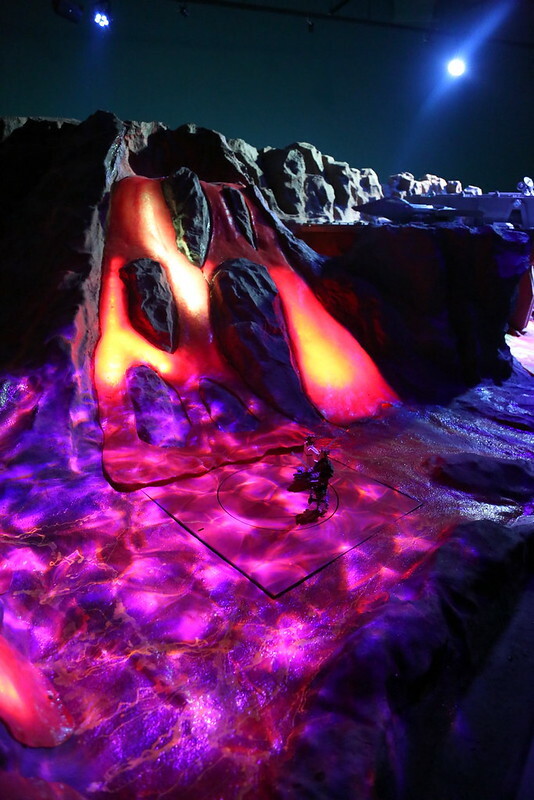 Also from Revenge of the Sith, the volcanic planet of Mustafar. We see the fateful duel between Obi-Wan Kenobi and Anakin Skywalker that eventually turns the latter into a cyborg. Hey! 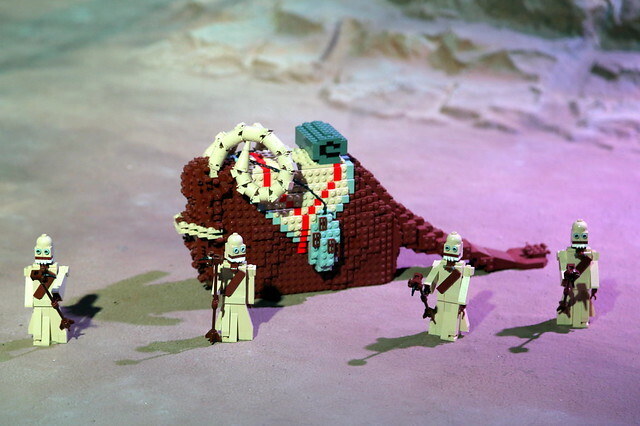 Tusken raiders and a Bantha. Where's the poodoo? Oh the desert planet of Tatooine, childhood home to Luke Skywalker....and his father Anakin Skywalker too. Funny how Lukey could stay hidden so long on the dad's very own hometown planet without detection! And here it is! 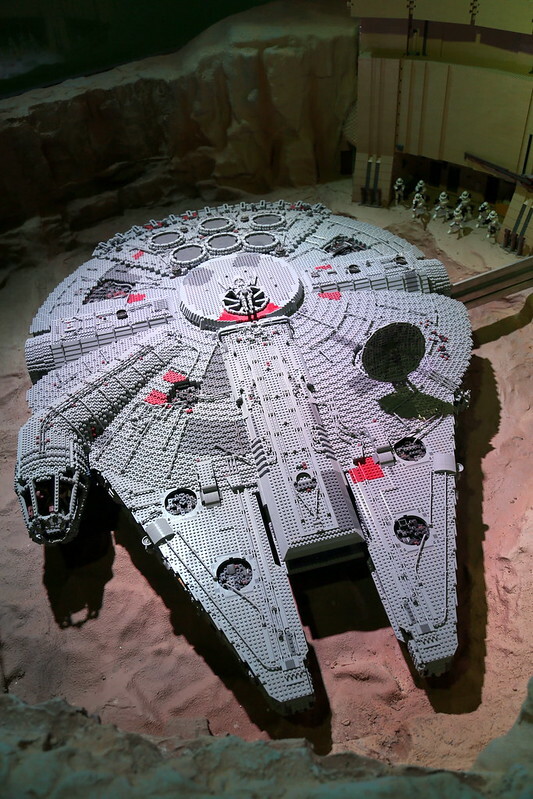 The largest ever LEGO model of the Millennium Falcon: 19,200 pieces of LEGO (gimme gimme!) and 143 hours to build. It is 1.8m long and 1.3m wide. This 37kg thing lifts off the ground with a pulley and counter balance system. Han and Chewie in the cockpit! 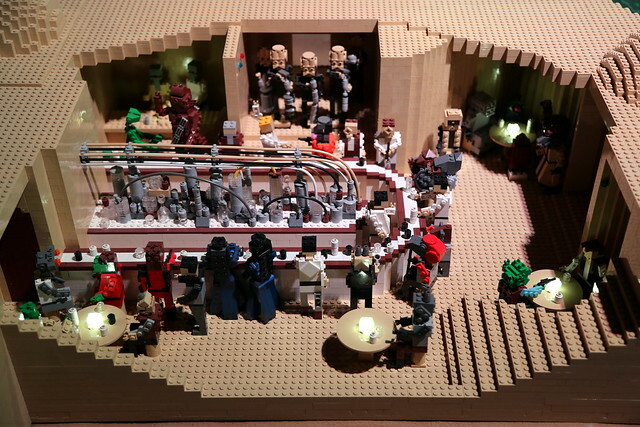 Take a peek inside the Cantina at Mos Eisley. Can you see Greedo and Han in the corner? Ah the frozen planet of Hoth (also first photo). 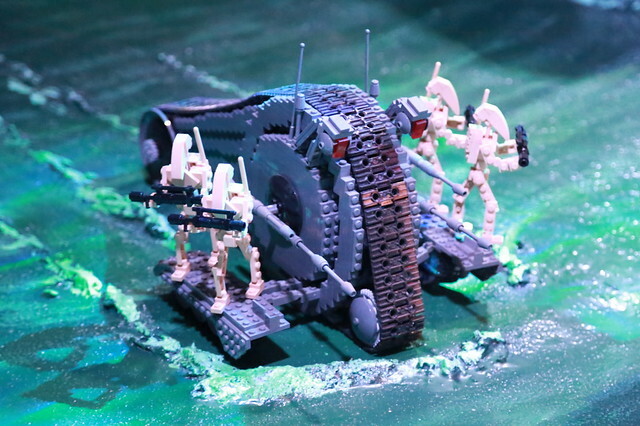 The Empire tracks down the rebels here, and they are forced to flee, despite a brave fight. 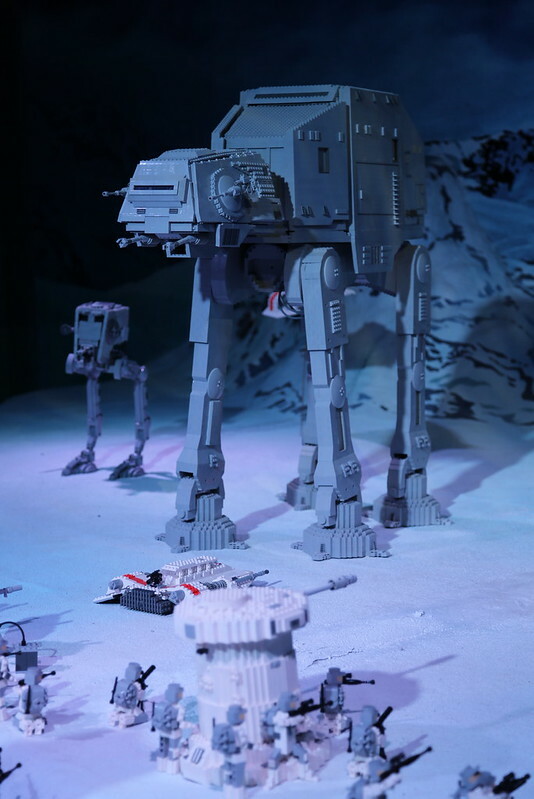 The AT-AT Imperial Walker is one of my favourites! An X-Wing fighter on Echo Base - the rebels' hideout on planet Hoth. On the forest moon of Endor, we have the Ewoks who fight against the Imperial forces alongside the rebels. With Wookiees already tall and technologically advanced, George Lucas made Ewoks short and primitive (but with great fighting spirit nonetheless). 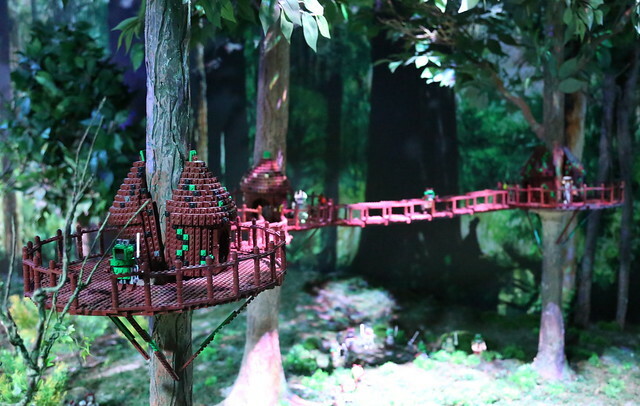 Ewoks live in villages built high among the trees, with wooden bridges connecting the huts. Each tree took three days to create, and are moulded from a real tree. Classic scene on Endor: Han Solo says "I love you" to Leia when she pulls out her blaster. She replies, "I know" - it's a reversal of what he first said to her on Hoth. 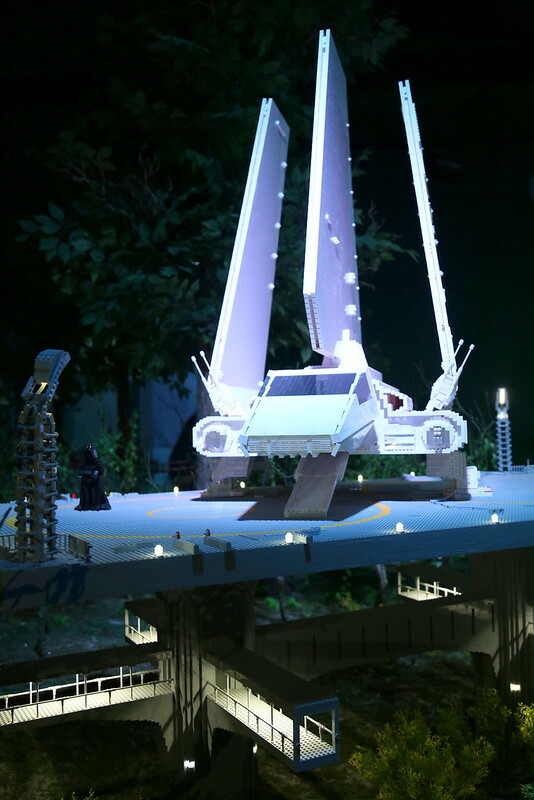 The Sith lord Vader arrives on Endor in his Imperial Shuttle, another gorgeous vehicle. Nearby is a massive shield generator weighing 72kg. The Battle of Christophsis (see the video clip at the link) is from the animated series "Star Wars: The Clone Wars". Obi-Wan Kenobi and Anakin Skywalker lead the Republic clone troopers in a vicious fight against the separatist army. Anakin single-handedly takes on the Octuptarra droids - yeah, the huge three-legged machines with balloon head, and lasers. Lasers!! Pew pew! Separatist droid army - Armored Assault Tanks (AAT); B1 Battle Droids; and B2 Super Battle Droids. It is rumoured that the battle droids numbered in the quintrillion at some point in time. 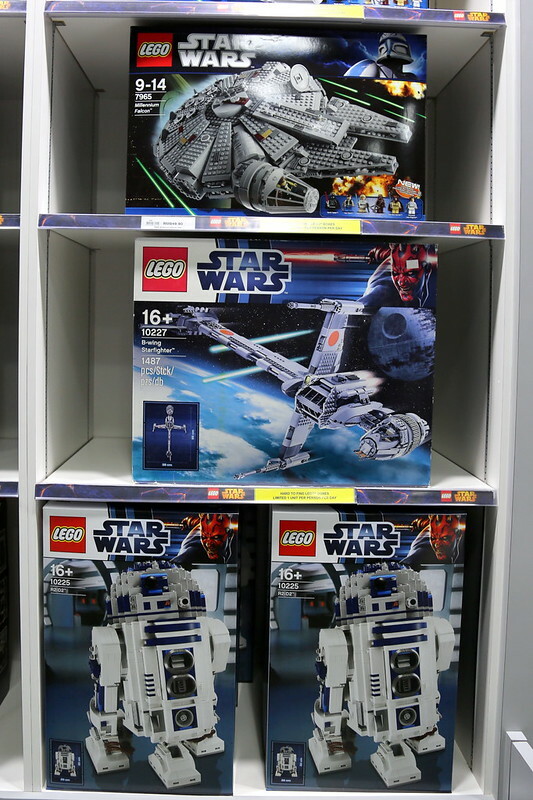 Once you've relived all those scenes, and marvelled at the versatility of LEGO bricks...you can take some LEGO Star Wars sets home and continue the joy. They really are 3D puzzles. I so want the Millennium Falcon (RM850 or US$267) and R2-D2 (dang, forgot the price)...these are rare box sets limited to one unit per customer per day. 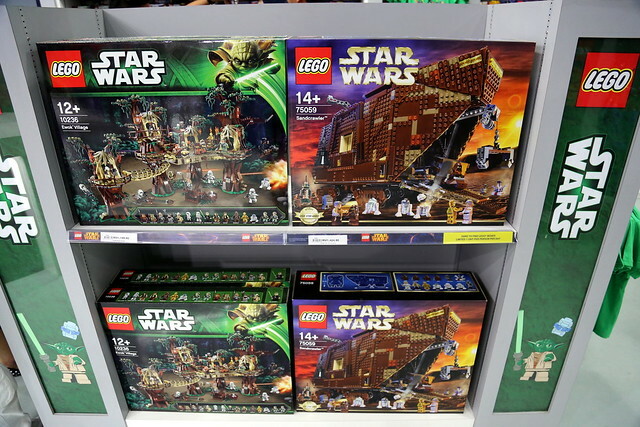 Fancy an Ewok Village for RM1,120 (about US$352) or a Sandcrawler for RM1,425 (about US$448)? Oh LEGO, why are you so out of reach? But I have this! I so enjoyed putting it together. 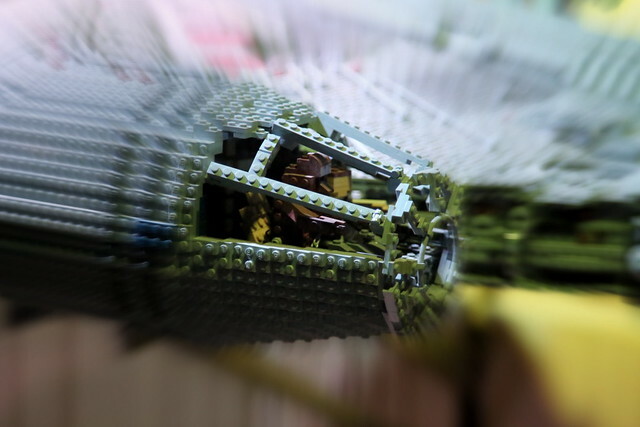 It's amazing when you build it and find that it's a functional toy with interactive parts in each section. Pulleys, lifts, swivels, doors, detachable ships, and even a spring-loaded cannon. Well, after all the intense gawking, we got hungry. Fortunately, LEGOLAND has over 20 restaurants, food stands and food carts. 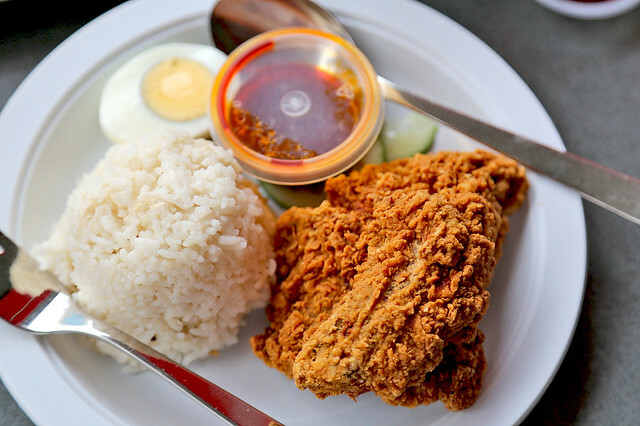 Nasi Lemak (RM12 or US$3.77) from the Asian Deli, just nearby. 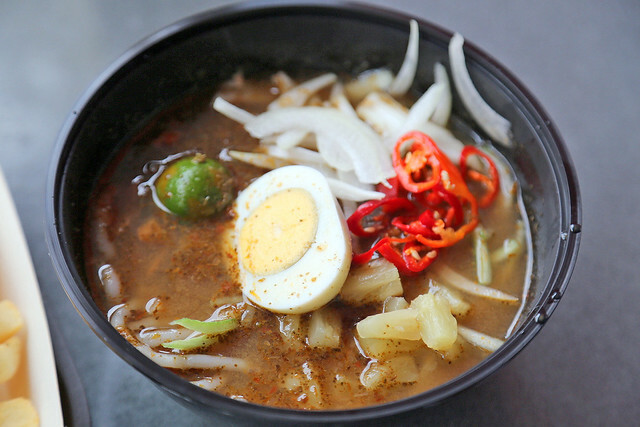 Penang Assam Laksa (RM12 or US$3.77) which was surprisingly decent! 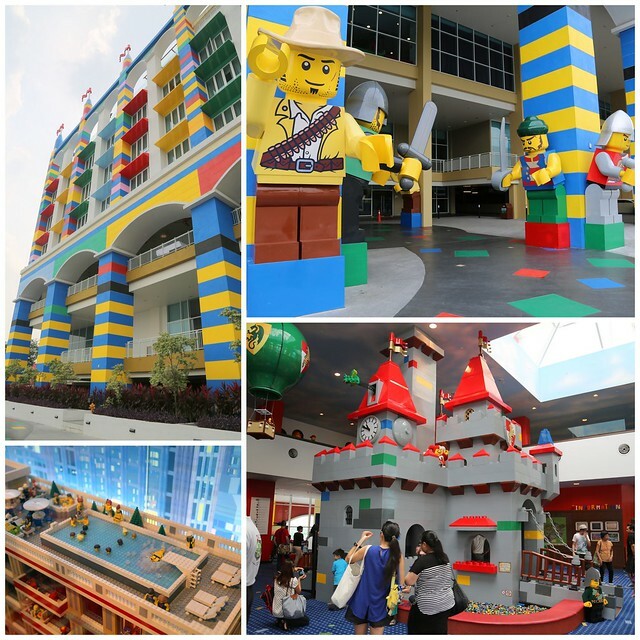 LEGOLAND Hotel also opened 29 Nov 2013, making the theme park and resort complete. 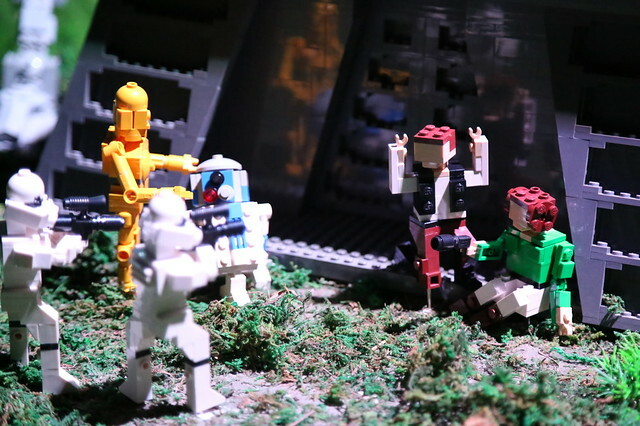 So now with the LEGO Star Wars Miniland, there's a lot more to see at LEGOLAND Malaysia, in addition to the 70+ rides, slides, shows and attractions already present. And don't forget the LEGOLAND Water Park that opened in Oct last year. Here is the full slideshow of the other 45 photos that I did not include here. Pity it doesn't show captions, but you can see the whole set on Flickr here.